3) What are you willing to sacrifice to make society nicer overall? 5) My september/october seasonal desserts! My TSH hormone level is OK, but what is "TSH"? In my August update I mentioned that I asked a doctor in July 2011 to have my hormones checked, but the only hormone that he requested to be measured was TSH, and that was within the "normal" range. In 1997 and 1999 I had blood tests to measure my hormone levels, and my TSH levels were fine at that time, also. I had no idea what TSH was, but the doctors told me that it meant I did not have a thyroid problem. So, since my thyroid is functioning correctly, what could be going wrong with me? What other hormones or chemicals could cause the type of problems that I was suffering from? The attitude among doctors, at least here in America as of 2011, is that if the pituitary gland is producing the proper levels of the TSH hormone, then the thyroid gland will produce the proper levels of T-3 and T-4. Since my TSH level has always within the proper range, the doctors told me that I had no problem with thyroid hormones. Does that logic make sense to you? The leaders of our medical community are... what? Naive? Stupid? To understand how naive (or stupid?) our doctors are, imagine a car mechanic who determines whether a transmission is working properly by checking the power level produced by the engine, and he assumes that if the engine is producing power, then the transmission is working correctly. Imagine that he doesn't bother to check the transmission! Certainly you can understand that it's possible for an automobile to have an engine that is working perfectly, but the transmission has problems. The fact that our pituitary gland is working properly doesn't guarantee that our thyroid gland is producing hormones properly! Imagine getting onto an airplane that is taken care of by mechanics who believe that they have to inspect only a few components of the airplane, and if those components are working fine, then they assume that all of the other components are working fine, also. Or how about having a meal from a chef who assumes that if the lettuce is fresh, then the fish, beef, milk, and everything else is fresh, also! 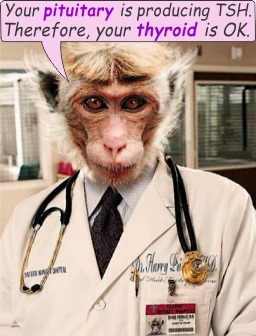 I finally find a doctor who will measure my hormones! In 1997 my father mentioned to me that he was low on the hormone DHEA, and I decided to go to the same doctor to find out if my DHEA levels were low, also. In August 2011, I decided to see if he was still in Santa Barbara. He is still here, and so I made an appointment for him to check my hormones. Unlike the doctor that I went to in July, he knew more about hormones than I do! He requested the laboratory to measure both of my thyroid hormones, as well as my levels of HGH, testosterone, and a few other hormones, vitamins, and chemicals. Incidentally, I was aware of the HGH hormone, but I assumed it was for children, and that adults did not need to be concerned about it. I recently looked on the Internet and discovered that not much is known about this hormone, especially how it affects adults. Hopefully, one of these days we will alter our society so that we can divert some of our money from silly activities into the research of health issues, and eventually we might figure out what HGH does for adults. † I assume this measured the total T-4, not the free T-4. Each thyroid hormone can be measured in two different ways; 1) the total level, and 2) the "free" level, which I assume means that it has not yet been used by our body. My DHEA level was high in August 2011 because I was taking large amounts of DHEA in a desperate attempt to feel better. My testosterone was within the acceptable range in both 1997 and 2011, but the level has been dropping. In 1997 my testosterone was near the high end of the acceptable range, but by 2011 it was near the low end of the acceptable range. If it continues on this path, it will soon be below the acceptable range. Incidentally, it seems as if the medical authorities altered the acceptable range for DHEA because the test results show a higher acceptable range today for age 55 (560 ug/dL) than the test results of 1997, when I was 41 (494 ug/dL). I suppose that is an indication that scientists are still in the process of trying to figure out what the acceptable range is. This in turn is more justification for experimenting with yourself rather than trusting the so-called "medical authorities". Do doctors prefer measuring the T-4 rather than T-3? When I asked the doctor in 1997 to check my DHEA levels, he also checked my T-4 level without me asking, but he did not check my T-3 level. This makes me wonder if doctors have a tendency to check the T-4 hormone more often than the T-3 hormone. If so, is this because people who have thyroid problems are more likely to have a problem with T-4? Or is it for financial reasons? The laboratory they did my blood analysis charges $33 to measure the free T-3 hormone, but only $17 to measure the free T-4 hormone, so perhaps some doctors avoid measuring T-3 in order to save us a few dollars. When we are in good health and ask a doctor for a routine checkup, then the doctors could justify doing only a few, common, low-cost tests, but when we ask a doctor for help solving very serious health problems, they should offer us a more thorough analysis, and they could tell us about the expenses involved in the tests, and if we couldn't afford all of the tests, then they could suggest the tests that we could start with. Thyroid supplements have made a phenomenal improvement! I am now taking liothyronine to compensate for my low T-3 hormone, and that has made a significant improvement. Actually, it is incredible; it is amazing! For example, my body can produce more heat. When I was young, I didn't need an electric blanket or a goose-down comforter, but perhaps 15 years ago I got a four inch-thick, goose-down comforter because I was getting cold at night during the winter, and a few years later I was getting so cold that I also added an electric blanket. I would remove both the electric blanket and comforter at the end of winter, but this year (2011) I removed the electric blanket but kept the comforter on all throughout the summer. Even more amazing, sometime in July 2011, I put the electric blanket back on the bed because I was getting cold at night. I was also wearing long underwear on some of those summer days, even though other men were wearing short pants and short sleeve shirts. Of course, Santa Barbara had a rather cool summer during 2011, so that might have been part of the reason I was so cold this summer. What are the medical scientists doing with their time and our money? It had occurred to me that the reason I was becoming increasingly cold was because of a thyroid problem, but the doctors reassured me that my thyroid was fine because my TSH level was within the normal range. My T-4 level was also fine. Therefore, I assumed my problem was either deterioration from old age, or some other hormone, such as testosterone. It never occurred to me that doctors could be so naive that I could have such a serious thyroid problem without them suspecting a thyroid problem. There are possibly tens of thousands of supposedly intelligent, educated scientists who are studying medical issues at hospitals, medical schools, universities, charities, and businesses. With so many intelligent, educated people studying medical issues, how is it possible that American doctors are unaware that checking TSH and/or T-4 levels is not an alternative to measuring both of the individual thyroid hormones? I have been appalled time after time by people who are considered "influential members of society". Most of them have one or more college diplomas, but they never produce any intelligent thoughts, or show any concern for society. Like a stupid animal, their main priorities seem to be making money, avoiding work, and feeling important. We can learn more about health issues by ignoring the "experts" and reading what the ordinary people are posting on the Internet! Also, it doesn't seem to me that many people in leadership positions have earned their position as a result of their talent. Most of them seem to have acquired leadership positions as a result of nepotism, brown-nosing, or by joining crime networks. Our leaders don't work with other people or look for talent; rather, they behave like Joseph Stalin and other aggressive savages who are intensely envious of competitors, and who try to eliminate competitors rather than compete with them. Do you know what your hormone levels are? 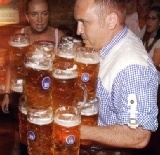 How many of you are suffering from too much or too little of some hormone? Or do you have a problem with your kidney excreting too much of a particular chemical, or not enough of some chemical? Or does your pancreas have a problem? Or is it your bone marrow that has a problem? How are we going to figure out if we have medical disorders when the typical doctor knows nothing about analyzing our body for medical problems? What are medical classes teaching their students? Are doctors being taught only how to dispense medicines and fix broken bones? Do the people who dominate the schools, hospitals, and medical organizations actually care about human health or society? The goal of a doctor and dentist should be the same as that of an airplane mechanic. Airplane mechanics do not wait for people to complain that the airplane has a problem; rather, they routinely analyze airplanes and look for potential problems. In a better society, the medical industry would be similar to the airline industry. Specifically, the doctors would routinely analyze each of us in order to identify potential problems, and they would offer us suggestions on how to prevent the problem from becoming serious. They would not wait for problems to occur, and then try to profit from them. Everybody is "defective"; nobody is "special"! The idea that most people are in good health and only a few people have medical problems is an idiotic philosophy. Everybody is defective, and so we all need routine medical analyses. Some of my other articles have already mentioned this concept that each of us is imperfect, but I will explain it again with a couple graphs. Humans are very arrogant, so we like to think of ourselves as "perfect". When we encounter somebody who has a quality that is better than ours, then they must be beyond perfect, so we describe them as being "special" or "gifted". A more accurate view of life is to consider everybody as having a variety of mental and physical defects. Nobody is perfect. When you encounter somebody who has an ability or talent that you don't have, he is not a "gifted" person. Rather, he simply has less defects in that particular area. This difference in philosophy may seem insignificant, but it has a profound effect on your view of life and other people. The athletes who have tremendous physical energy and talent are not "special" people. Rather, their bodies are simply less defective than those of us who cannot do what the athletes do. The people who have tremendous coordination with their fingers are not gifted; rather, they are simply less defective than the people who are clumsy. The people who can produce intelligent thoughts are not special people, either. Rather, their minds are simply less defective in certain areas than the people who are stupid. The human gene pool has the data necessary to create a healthy, nice looking, intelligent, talented person, but unfortunately, our gene pool is contaminated with a lot of primitive and defective qualities. 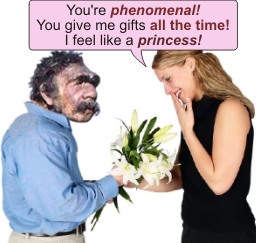 If anybody were to get all of the wonderful traits, and none of the primitive or defective traits, then he would be an intelligent, talented, good looking, healthy person, but that type of person should not be considered as "special" or "gifted". Rather, he should be described as "what a normal, healthy human should be". If we could identify every physical and mental trait of the human race, and then measure how close each of us come to having the best possible trait that the human gene pool is capable of creating, we would find that only a few people come close to being the best possible in any trait. Most people are below the best in everything. This graph below might help you to understand this concept that the best any of us can be is the best of the human gene pool. None of us can be "beyond human"; none of us can be so much more intelligent, coordinated, or talented that nobody else comes close to us. 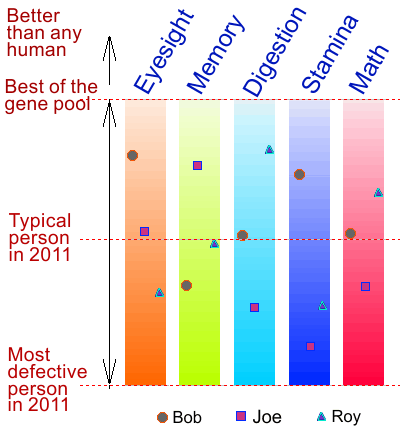 • Bob has better eyesight than Joe and Roy, but Bob does not have the best possible eyesight that the human gene pool is capable of creating. • Joe has a better memory than Bob and Roy, but his memory is not as good as what the human gene pool is capable of creating. • Roy has the best digestion abilities, but his digestive system is not the best possible that the human gene pool is capable of creating. If we were to control reproduction, we would reduce the defects of each generation. People would become closer to the best that human gene pool is capable of creating. You can imagine what these less defective people would be like; all you have to do is look at the people around you and imagine one person has all of the wonderful traits that you see in the human race. Imagine a man who has the athletic abilities of the greatest athlete; the eyesight of the person with the best eyesight; the coordination of whoever has the greatest coordination; the math abilities of the greatest mathematician; the artistic abilities of the greatest artist, etc. This graph might help you to understand this concept. After centuries of controlling reproduction, people would have fewer and less serious defects, and there would be less variation between people. Everybody would become closer to the best that the human gene pool is capable of creating. 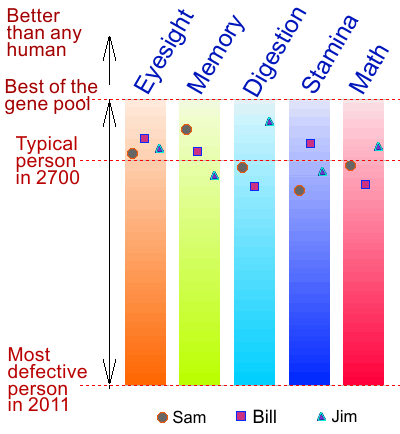 The fact that some people have excellent eyesight is proof that the human gene pool has the data necessary to produce high-quality vision, and the fact that Olympic athletes can run a 42 km (27 mile) marathon in slightly more than two hours is proof that the human gene pool has the data necessary to design a body that can produce a lot of power and has a lot of stamina. The human gene pool has a lot of highly advanced data in it, but unfortunately, it also has a lot of defective and primitive data. The end result is that none of us get all of the wonderful, modern data. Each of us is best described as "defective". 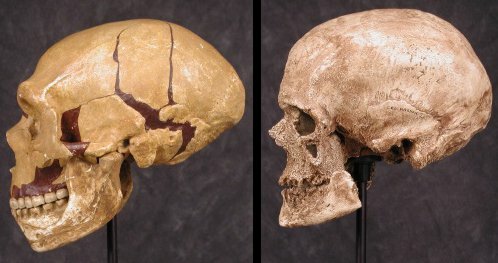 Each of us was created with a random mixture of good qualities, genetic defects, and crude traits from prehistoric eras. A society that cannot understand or deal with this concept will degrade into retards, criminals, parasites, and freaks, and their society will eventually disintegrate. The societies that dominate in the future will be those that can understand these concepts, and who have the ability to restrict reproduction to the better quality people. The future societies will also design their medical system to routinely monitor everybody's health from birth to death, rather than allow doctors and businesses to profit from medical disorders. After reading this article, somebody gave me a comment that made me realize that I should expand this concept, and I like his expression of "baseline", so I will use that word. When I say doctors should monitor all of us from birth to death, one of the reasons is to have detailed records of our hormone levels, blood pressure, etc., when we are in excellent health, and at different ages, in order to provide us with a baseline to compare us to when we don't feel right, and as we grow old. And a database with everybody's medical information allows us to determine more accurate ranges for hormones, vitamins, etc. It would also be entertaining to look through the database to see how we compare to other people. For example, I wonder how I compare to athletes and Navy SEALs, who do things that I couldn't even come close to doing. Why do we need a doctor to authorize blood tests? The laboratory that did my blood test is near from my home, so it's convenient for me to go there to have my blood analyzed. I asked an employee if I could have my blood tested whenever I pleased, but they said the laws of California prohibit them from providing their services to the public. The laboratories will give us blood tests only if we have a doctor's request for a blood test. Does that law make sense to you? How am I supposed to know how high my T-3 or DHEA level is going unless I can have a blood test once in a while? Why are we restricted from having these analyses? Who benefits by requiring us to get a doctor's request for a medical analysis? To understand how idiotic these laws are, imagine if we had laws that prohibited us from having direct contact with car mechanics, and that we were not allowed to measure our transmission fluid, oil level, or gasoline levels. In such a case, when we wanted to measure the oil level in our car, we would first have to pay a high fee to a "car doctor" for a request for a mechanic to measure our car's oil level. Then we would take the request to a car mechanic! We are not allowed to see the results of our blood tests! The laboratory that did the analysis of my blood has a notice on their wall to inform us that the laws of California prohibit them from providing us with the results of our tests. They are required to give the results only to the doctor. Therefore, if we want to know the results of our test, we must ask our doctor to see the results. To understand how idiotic that law is, imagine a continuation of my previous scenario. Specifically, you have contacted a car doctor and paid him a high fee in order to get a request for a car mechanic to measure your car's oil level. The mechanic measures the oil level, but he sends the results to the car doctor because he is not allowed to let you see the results. You must then go back to the car doctor, ask him about the oil level, and then pay him another high fee. If the mechanic discovered that your car was low on oil, then the car doctor would write a prescription for high-priced oil. You then have to go to a special car pharmacy to fill the prescription, and you have to hope that there is a generic brand of oil because the other brands are much more expensive. If you wanted the oil measured again in a few months, you would have to go back to the car doctor for another request for a mechanic to measure your car's oil level. Are these laws intended to protect us from something? Or are these laws intended to force us to go back and forth to doctors in order to provide them with more money? Why do some hormones need prescriptions, but not others? My blood test in May 1997 showed that I was low on DHEA. I was lucky that this particular hormone can be taken in the form of a pill (as opposed to being injected), and that this hormone is available without a doctor's prescription, and at a low price. However, I cannot purchase thyroid hormones without a doctor's prescription, and the thyroid hormones are much more expensive than DHEA. Why do thyroid hormones require a prescription? Is our government trying to protect us from something? Or is it because thyroid hormones are more expensive than DHEA, and therefore more profitable? Testosterone also requires a prescription, and it is also expensive. How does the American government decide which drugs should be restricted to prescription only? Why is aspirin available to everybody at low cost, but insulin requires a doctor's prescription? Why is sugar available to everybody at low cost, but businesses are not permitted to use Stevia as a sweetening agent? Why are American farmers allowed to raise chickens, cows, and salmon on unnatural diets and in unnatural living conditions, but the farmers are not allowed to grow hemp for use as fiber or food? Some of our idiotic laws seem to be created by criminals within the government who are helping their criminal friends in business. For example, the laws that restrict Stevia and hemp seem to be intended to help the businesses that must compete against those items. But why do we have laws that require a doctor's prescription for insulin, testosterone, thyroid hormones, and certain other products? Who benefits from those laws? Certain drugs and hormones are used (and abused) by bodybuilders to develop larger muscles, and by athletes who cheat in their competitions. Also, there are reports of athletes using thyroid hormones as a way to rapidly lose a few pounds, such as the boxers who must fit within a very narrow weight category. Therefore, it's possible that some of our laws are intended to prevent the cheating and abuse by athletes and bodybuilders. However, if those laws are intended to control the athletes, then the laws are failing. There are so many athletes who cheat that they are routinely tested for cheating. We are not stopping athletes from getting access to the restricted hormones or drugs, so who benefits by making them available by prescription only? From what little I know about the prescription drug industry, the only people who benefit from these laws are the pharmaceutical companies and the doctors. The pharmaceutical companies seem to be able to charge more money for drugs that are available only by prescription, and the doctors benefit because we have to pay them a high fee every time we want to get a prescription. Imagine if some of the items necessary to maintain a car required prescriptions. For example, imagine that whenever you wanted to put oil in your automobile engine, you had to pay a high fee to a car doctor for a prescription for oil, and then pay an automobile pharmacy for some expensive, prescription oil. The official justification for prescriptions is to protect us from our stupidity and ignorance, but if we are going to follow that philosophy, then why not make everything by prescription only? For example, why not make pet dogs available by prescription only? That would allow us to protect the stupid people who waste an enormous amount of their money on pets, and it would also protect the stupid people from fleas and ticks, and it would allow us to reduce the amount of dog poop in our cities. Or why not require a doctor's prescription to enter a gambling casino, purchase a state lottery ticket, or purchase jewelry? That would allow us to control the amount of money that stupid people are wasting on gambling and jewelry. Most people are doing a terrible job of selecting a spouse. Most relationships fail rather than develop into a marriage, and most of the marriages are unpleasant. Therefore, why not require us to get a prescription for a spouse from a "Marriage Doctor"? The Marriage Doctor would analyze our personalities and lifestyle, and he would prescribe a spouse that is a good match for us. Incidentally, although the concept of a "marriage doctor" is sarcasm, I honestly believe that if we had some respectable and intelligent marriage doctors, they would do a better job of selecting spouses for the majority of people. Most women, for example, are attracted to men who behave like puppy dogs, and most women don't care whether the man is a criminal, psycho, or parasite. And the main priority of most men is the physical appearance of a woman, not her mental qualities. Actually, some men don't even care if their partner has a functional brain; some men are happy with an inflatable doll, a retarded child, or an animal. Most people are so poorly adapted to this modern world that they would have a more pleasant marriage if somebody with more intelligence and responsibility would select a spouse for them. The same concept applies to political leadership. Most voters do such a terrible job of selecting political candidates that we would provide ourselves with higher quality government officials if most of the voters were told to let people with better mental qualities do the voting. Every year there are more people using medicines and getting medical treatments. One reason is that people are living longer than ever before, and another reason is that as we learn more about health and nutrition, we discover that more of us are actually suffering from medical problems that are treatable. The medical industry is already a very significant part of our economic system, and it's going to become even more significant in the future. Therefore, it is in our best interest to make the medical industry as efficient as possible. One way to make the medical industry more efficient is to insist that all adults be responsible for themselves. For example, people who have to take medicines should be told to learn about their particular medicines. The people who are too irresponsible, lazy, or stupid to properly use their medicines should be regarded as crude savages who don't belong in this modern world. We should not feel responsible for them, or waste our time trying to help them with their self-inflicted problems. When we demand that adults be responsible for themselves, we can make all prescription drugs and devices available without a prescription. By removing the restrictions on hypodermic needles, insulin, thyroid pills, and every other drug and medical device, we make society more efficient because we eliminate all of the jobs that are needed for the restriction of these items. If somebody is foolish enough to inject themselves with insulin even though they don't need it, that is their problem, not ours. Or if a stupid athlete wants to abuse hormones, why should we care? Why should we feel sorry for stupid people? If a person wants to abuse Vicodin, why should we care? Why should we waste our time trying to stop neurotic people from hurting themselves? We have no obligation to take care of freaks. Furthermore, we don't even have to live with freaks! We could exile all of the freaks on the grounds that we don't want to deal with their idiotic, self-inflicted medical problems, and we don't want to listen to them whining about how we need to take care of them after they hurt themselves. Everything that we need for good health has to be kept within a certain range. Too much or too little of anything will kill us. Too much oxygen, for example, will kill us, but too little oxygen will kill us also. If some psychotic people were purchasing tanks of oxygen that were intended for oxy-acetylene torches, and if they were breathing the oxygen because they enjoyed the sensation of excessive amounts of oxygen, and if some of them were hurting themselves in the process, would you approve of society putting restrictions on the sale of oxygen in order to protect the psychos from their self-destructive habits? Would you want every welder and every company that used oxygen to have to go through procedures in order to prove that they were using the oxygen for a legitimate reason rather than for entertainment? A lot of bodybuilders and athletes have discovered that certain drugs and hormones can help their muscles grow, cause them to lose fat, or provide them with more energy, and society has reacted by putting restrictions on these drugs in order to stop the athletes from using and abusing these drugs. However, the laws that are trying to control the athletes are as worthless as the laws that are trying to stop people from using marijuana, cocaine, and heroin. The people who want these drugs are going to get them regardless of our laws. The laws that try to stop athletes and other people from abusing drugs and medical devices are a nuisance to society because they make society less efficient, and they require a lot of people work in the unpleasant job of trying to control the self-destructive and stupid behavior of crude adults. Why should anybody have to spend his life trying to control the stupid people from their self-destructive habits? Do you think that you would get job satisfaction if you spent your life giving blood tests to athletes in a futile attempt to stop them from cheating? Or imagine spending your entire life trying to catch people who sell steroids to athletes. People who try to stop the sale of illegal drugs are wasting their life because they are never going to accomplish anything. They catch some drug dealers, put them in jail for a few months, and then they repeat the process, over and over. It would be better if those people were given jobs that are more useful to society, and that would provide them with more job satisfaction. My suggestion is to make virtually everything legal for adults, and to demand that all adults be responsible for their behavior. If they hurt themselves when they take drugs or hormones, then they can suffer the consequences. Society should not feel any responsibility to take care of the jerks who abuse drugs, bicycles, motorcycles, knives, guns, or anything else. Children need to be taken care of, and they need lots of restrictions on foods, material items, knives, razor blades, and drugs, but adults who are unable to cope with the modern world should either be exiled, or they should be told to suffer the consequences of their self-destructive and idiotic behavior. We should not feel responsible for incompetent or psychotic adults, and we should not feel sorry for them when they hurt themselves. If an athlete develops cancer or liver problems as a result of his abuse of hormones, for example, that is his problem, not your problem or my problem. Let him suffer or die. We don't owe him medical treatment for his self-inflicted health problems. We should raise the standards for our citizens. Society should be designed for honest and responsible people, not criminals, idiots, or freaks. Schools should teach children about health, and they should be taught that every item that we need for good health has to be within a certain range. The children who ignore that information, or cannot understand it, should be classified as defective children, or primitive savages, or retards, and we should not worry about them. If they hurt themselves, it is their problem, not ours. Society should not have to suffer as a result of crude or psychotic people who hurt themselves. Likewise, people who ignore safety warnings, such as people who cross over railings at national parks, or who climb over fences at electrical substations, or who ride bicycles on staircases, or who take hikes in mountains during winter storms, should be told that they do these dangerous activities at their own risk. None of us should feel responsible for such fools. We are not obligated to search for people who get lost as a result of their own idiotic behavior, and we are not obligated to provide people with any type of medical assistance for their self-inflicted problems. When these foolish people accidentally kill themselves as a result of their dangerous activities, our attitude should be, "Good riddance to another psycho!" Do any of us have thyroid problems from nuclear bomb testing? The thyroid gland is damaged by radioactive iodine, and children seem to be more sensitive than adults. For example, thousands of children who lived near the Chernobyl nuclear reactor developed thyroid cancer after the "accident" (I suspect it was sabotage by Jews). What happens if a child is exposed to some radioactive iodine, but not enough to cause cancer? Could small doses of radioactive iodine kill or damage some of the thyroid cells, thereby causing hormone problems? The reason I ask this question is because when my mother was pregnant with me, America and Russia were testing nuclear bombs on land and in the atmosphere, and radioactive waste was falling all around America and the world. Is it possible that some of the radioactive iodine killed or hurt some of my thyroid cells? 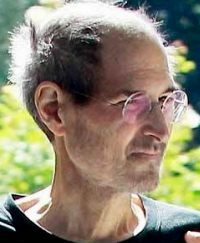 Steve Jobs is eight months older than I am, and he just died from pancreatic cancer. Why did he have cancer? Like most people, Steve Jobs was secretive about his health problems, but nobody benefits by keeping medical information secret. Rather, the secrecy is interfering with our understanding of health and nutrition. Everybody, including Steve Jobs, would benefit if we put all of our medical and dental information into a public database so that scientists around the world could analyze it. A detailed medical database might show us some very valuable patterns in regards to who is developing thyroid problems, allergies, and the unusual type of pancreatic cancer that Steve Jobs was suffering from. There were so many children developing thyroid cancer near the Chernobyl nuclear reactor that nobody needed a database to notice that obvious connection, but there may be lots of subtle or complex patterns that we will not notice until we let computers do analyses on an extensive and detailed database. For example, a computer analysis might show us that Steve Jobs, George Harrison, and other influential people who cause trouble or give competition to the Jews are developing mysterious illnesses at a higher rate than the people who are approved of by Jews. We might also find that a lot of influential people have a tendency to die during the ambulance ride to the hospital. We might also find that influential people have a tendency to die more often at the hospitals that are dominated by Jews. Can abnormal hormone levels interfere with nutrition? The doctor that I went to in July 2011 for a blood test told me that I was anemic, and he gave me a bottle of multivitamin pills. I didn't think I was suffering from poor nutrition, but I know I wasn't eating as much food as I was a few months earlier, so I started taking those multivitamin pills. If the vitamin pills really do deliver the high level of vitamins that they claim, then from the middle of July onward, I would have ended any nutritional deficiency I was suffering from. The next month (August), I asked the doctor to check my hormones, and he suggested that in addition to measuring my hormone levels, I should also measure vitamin D, B12, and folic acid because he has encountered a lot of patients who are low on those particular nutrients. I agreed to the tests even though I was thinking to myself that measuring my vitamin D level would be a waste of money because I was taking a multivitamin pill every day, and I was also routinely eating mushrooms that supposedly had plenty of vitamin D in them because they were exposed to ultraviolet light while they were growing. I assumed that I was getting more vitamin D than I actually needed. I was shocked when the results of the blood test came back and showed that my vitamin D level was only 20 ng/mL, which is supposedly the bare minimum necessary. How could my vitamin D level be so low when I was getting so much in my diet? The blood test I had in July 2011 showed that I was low on sodium, but how could I be low on sodium when I put salt on so much of my food? This makes me wonder, are the tests that measure these blood chemicals accurate? If they are, then I have to wonder if the reason I was low on vitamin D was because my low hormone levels were interfering with digestion, or with the absorption or processing of the vitamin after it gets into my blood. 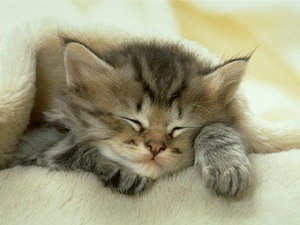 I was resting for two hours after a meal! Another reason I wonder if my hormone problem was interfering with digestion is that during 2011 I once again had to stop eating breakfast because I was becoming more extremely tired after eating a meal. For many decades I have been avoiding breakfast because I didn't feel very good after eating a meal, but by 2011, it was becoming ridiculous. After eating breakfast, I would go back to my computer and resume working, but as my food began to digest, I would become increasingly tired, and after about a half an hour I would want to sit down, and eventually I was becoming so exhausted that I would lay down for an hour or two. This was interfering with my work, so I decided to stop eating breakfast. This problem of becoming exhausted as my food was digesting was also occurring after I ate dinner, but at night it didn't interfere with my work, so I didn't care. I ended up lounging in front of the television for about two hours every night. I haven't watched so much television since I was a child. Why was I losing weight rather than gaining weight? One of the symptoms of low levels of thyroid hormones is that many people gain weight, but why do they gain weight? Is it because they eat virtually the same amount of food while their metabolism slows down and they become too tired to get exercise, thereby resulting in more of their food being converted into fat? One of the reasons that I dismissed the possibility that my thyroid hormone levels were low was because I was losing weight rather than gaining weight. If I remember correctly, I was only 117 pounds (I'm 6 feet tall, 183 cm) in July 2011, when I went to a doctor for a blood test. However, perhaps the reason I was losing weight was because I was eating less food. I have seen lots of old people taking naps after a meal, so I assumed that the reason I needed two hours of rest after eating a meal was because I was aging at a much more rapid rate than a normal person. I had heard about the genetic defect called progeria, which causes children to die of old age before they have become adults, and I assumed that my body, even though it was only 55 years old, had already aged to the state of somebody who is 90 or 100 years old. However, now that I am taking hormones, I can eat a meal without being tired afterwards! This makes me suspect that my low hormone levels had reduced my energy production to such a low level that my body needed to use all of its energy for digesting the food, thereby leaving nothing left for my muscles, and so I had to lay down for an hour or two and do virtually nothing while my food was digesting. Could certain hormone problems be mistaken for diabetes? Another reason that I cut back on my consumption of food was because I didn't feel good after eating a lot of food. When I was in my early 20's I began to wonder if I had a problem with sugar, or some mild form of diabetes, so I tried to avoid sugar. My dad had a brother who died in the late 1940's, supposedly of diabetes, so I wondered if I inherited a mild form of that same problem. However, now that I'm taking hormones, I don't have as much of a problem with food, and this makes me wonder if perhaps the reason I was having trouble with food and sugar was because my low hormone levels were somehow interfering with the digestion of food, or the processing of sugar or insulin, or the production of insulin, or the conversion of sugar into fat or energy. I can't explain what is going on, but I wonder if some of the people who have symptoms that resemble diabetes are actually suffering from some combination of hormone problems rather than diabetes. Or, perhaps some of us have a mild problem with blood sugar that would normally be insignificant, but it becomes more serious when we also suffer from certain types of hormone problems. If low hormone levels can interfere with nutrition, then it would be possible for doctors to misdiagnose a person if they don't look at the hormone levels. The doctor that I went to in July, for example, who doesn't know much about hormones, told me that my problem was that I was anemic, and his solution was for me to take vitamins and eat more food! If low hormone levels can interfere with our immune system, then perhaps some people who are suffering from strange illnesses, allergies, or arthritis are actually suffering from hormone problems. What is the effect of multiple hormone problems? Household chemicals, such as ammonia and bleach, can interact with one another. Some medicines also interact with each other, and as a result, before a doctor prescribes a medication, he should ask his patient for a list of medications that he is already using. Does this concept apply to hormone problems? In other words, if your T-3 hormone is too high or too low, you will suffer certain problems, and if your insulin, testosterone, or T-4 hormones are too high or too low, you will suffer certain other problems, but what if several hormones are too high or too low? Do you simply get all of the problems that each individual hormone causes? Or could a combination of hormone disorders result in some completely new medical problems? The medical information about hormones describes the symptoms of a person who has either too much or too little of one particular hormone, but I am low on DHEA, T3, and HGH, and my testosterone is dropping rapidly. What does that combination of hormone problems cause? And I may have other problems that I am not yet aware of! My levels of HGH are below normal, but there does not seem to be much information on what HGH does for adults. What if HGH has some direct or indirect effect on my thyroid gland, liver, pancreas, or kidneys? Then the low level of HGH would directly or indirectly interfere with some other function of my body. This could create a lot of confusion in regards to helping people with their health problems. For example, imagine that my low HGH level is indirectly causing my thyroid gland to produce less of the T-3 hormone. Now imagine another man who is virtually identical to me, except that he has a proper level of HGH. However, imagine that his thyroid gland is defective, and as a result, his thyroid is producing a low level of the T-3 hormone. In other words, each of us is producing the same low level of T-3 hormone, but in my case, it is because I have a low HGH level, and in his case it is because his thyroid gland is defective. From the point of view of today's doctors, since both of us have the same low level of the T-3 hormone, the doctors would assume that we are suffering from the same problem, but in this imaginary scenario, I would be suffering from low HGH levels, and the other man would be suffering from a defective thyroid gland. Therefore, each of us would actually need a slightly different treatment. Furthermore, we might need different levels of the T-3 hormone in our blood because one of us might use the hormone more efficiently than the other. The point I am trying to make is that none of us have just one, simple medical problem. All of us have a variety of defects, and that might create some complex medical problems, and so the treatment for one person is not necessarily the same as for another, and the amount of vitamins, salt, water, oxygen, hormones, and food that one person needs may not be the same as another, even if they are the same age and weight. Since doctors don't know much about medical problems today, each of us is going to have to do some experimentation in order to figure out how to keep ourselves in the best health. I mentioned in this file about food that I wondered if part of the reason that I was losing weight and becoming increasingly tired was because I had been taking high levels of hot peppers for a year or more. However, now that I'm taking thyroid pills, I feel so much better that I doubt if the hot peppers were causing problems. Or, if the hot peppers were causing trouble, perhaps it was because my low thyroid levels were interfering with the digestion of food and/or the absorption of nutrients, and perhaps that in turn was allowing the hot peppers to have a bad effect on my stomach, or on some other part of my body. 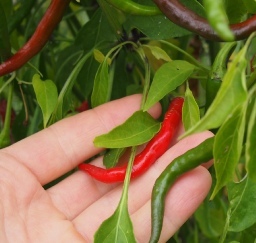 Near the end of September 2011 I decided to start eating the red chili peppers that I had planted in my backyard. The peppers are small, as you can see in the photo. I am usually eating only one pepper a day, and I am removing the seeds, and I have no idea how much capsaicin they contain, but they have not caused any trouble yet. Where is the best location for testosterone cream? Most of the instructions for testosterone cream suggest putting it on the shoulders or abdomen, but according to some doctors who claim to have studied this issue, the skin that absorbs the most testosterone is the scrotum. Therefore, by applying it to the scrotum, a person needs less of the cream, which means that he saves his time and money, and he saves society some of its resources. Other doctors warn that testosterone cream should not be put on the scrotum because it causes the testosterone to convert into an inappropriate hormone. Why are they disagreeing on this? Is it because nobody actually knows? Or is it because different medical schools are providing different levels of education about this issue? It is easy to compensate for low T-3 levels because all we have to do is take a pill, and testosterone can be boosted by applying a cream to our skin, but HGH is like insulin; it comes in the form of a liquid that needs to be refrigerated, and it has to be injected with a hypodermic needle. It is also very expensive. I suppose I would get used to injecting myself, but I would rather not do it, and so I'm not having any HGH injections. For all we know, once a person becomes a certain age it might be better to have lower levels of that hormone in order to prevent our nose, ears, intestines, and other parts of our body from growing excessively. I already feel very good after less than three weeks of treatment with thyroid pills and testosterone cream, and I have already regained some of my lost weight, so I will just ignore my HGH levels for now. Incidentally, the scientists who develop the laboratory procedures to measure chemicals in our blood ought to provide documents that show us the accuracy for each test, but I'm not yet aware of where these documents are, or even if they exist. Or, the laboratory that measures these chemicals could include "± ×××" value next to every measurement to show us the accuracy of each test, but they don't. Why not? Are these tests so accurate that they don't feel any need to bother telling us the accuracy levels? All of us benefit when everybody has a job that they enjoy, and which is productive to society. I also think we would create a nicer society if we reduced the number of unskilled laborers, and if we stopped the practice of using foreigners for low-cost labor. Therefore, I think you should seriously consider what you are willing to alter about society, and what you are willing to sacrifice, in order to reduce the number of unpleasant jobs, and reduce the need for unskilled labor. I already mentioned that we can eliminate some unpleasant jobs simply by allowing all prescription items to be available to everybody without a prescription, and by telling adults to be responsible for themselves. Now I will point out that another way to reduce unpleasant jobs is to provide food for free. This eliminates all of the jobs involved with the processing of money, and it reduces the number of unpleasant quality inspection jobs. The free enterprise system is based on the assumption that the majority of consumers are educated, responsible, and intelligent, and that they will make wise decisions about products and businesses. In reality, the majority of people are of limited intelligence; they follow one another like stupid animals; they are afraid to try new foods; and they resist thinking and learning. When a society requires that businesses compete with one another for the attention of the ordinary consumer, then the businesses have to struggle to appeal to what is essentially a horde of crude savages. Through trial and error, the businesses have discovered that one method of attracting the attention of the savages is to provide food that is visually appealing. As a result, businesses and farmers set up inspection lines, and they have employees remove damaged or visually imperfect food items. All of the employees who are involved in these attempts to titillate and manipulate consumers are working in jobs that are worthless to society, and most of their jobs are unpleasant and monotonous. Nobody wants to spend their life looking for flaws in peaches, for example. Furthermore, inspecting food is futile because even if all of the food that comes off an inspection line is 100% perfect, some of it will be attacked by insects, or deteriorate in other ways, as it travels to market, or as it sits in the market. Therefore, food that has been inspected by the farmer or business will have to be inspected again by the consumer or restaurant. Another problem with inspecting food is that resources and engineering talent are need to create and maintain the inspection lines. Society would benefit much more if that engineering talent was put into more productive tasks. If we alter our society so that food is provided for free, we can eliminate a lot of the unpleasant, inspection jobs. The farmers and food processing businesses would continue to compete with one another, but they would be trying to please the government officials who are supervising food production, rather than trying to appease a horde of crude consumers. Of course, as I've mentioned in other files, we cannot implement these type these advanced improvements until we provide ourselves with better leadership. We need leaders who are truly honest, responsible, and concerned about society. 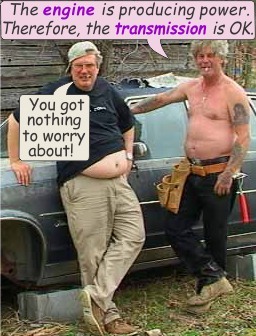 As of today, our government officials are a more disgusting group of people than the majority of people! If we are capable of creating a society in which food is provided for free, then we could let machines do a lot more of the harvesting, packing, and preliminary inspections of food. A lot of the food that they provide to us will be imperfect, but the solution to that problem is to tell consumers and restaurant workers to look at the food before they eat it. 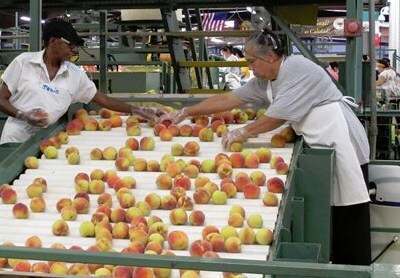 In free enterprise economy, the consumers and restaurants must purchase food, and so they become upset if they discover that some of their apples or peaches are imperfect, but when food is provided for free, if somebody discovers that one of his apples is rotten, all he does is discard it and get another. He has no reason to complain. Another method that businesses use to attract the crude consumers is to offer highly processed food that is ready-to-eat. Many consumers believe that the less work they do, the happier they will be, and so they prefer foods that don't require them to do any work. For example, most consumers do not want to break open walnuts, pecans, or peanuts, and so businesses are extracting the nuts for the lazy consumers. Unfortunately, the processing of nuts requires that people design and build the machines that remove the nut from its shell, and this in turn wastes society's engineering talent, electricity, and resources. The processing of nuts may also be detrimental to our health because after a nut has been removed from its shell, it starts deteriorating. If we were to tell consumers to crack open the shells by themselves, we would reduce some of the unpleasant, boring jobs; we would save resources; and we might keep ourselves in better health. 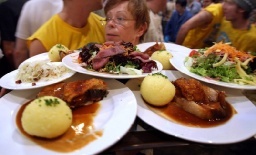 Restaurants today are cramped, and the waiters must rush around frantically with large amounts of food balanced on their arms, wrists, and shoulders, and they must meander through crowded, narrow aisles like a trapeze artist. It's possible that some people truly enjoy these jobs, but I think it would be better if we reduced the number of people doing this for a living. In the variation of my "City of Castles" that I am most interested in experimenting with, none of the homes have complete kitchens. Everybody gets their meals from restaurants, or by picking up food at markets. A city that is designed for this type of lifestyle would not need to waste any land or resources on private kitchens or dining rooms. Instead, the restaurants would be provided with plenty of land so that they are very spacious. There would be plenty of empty space around each of the tables so that people can easily walk around the restaurant without bumping into other tables or one another. Furthermore, since all of the food is provided for free, people can enter and leave the restaurant whenever they please. Nobody has to wait for a waiter to provide them with a check, and none of the restaurant employees have to waste any of their time or any of society's resources on the processing of money or credit cards. By designing a society with lots of spacious restaurant, and by providing food for free, we could eliminate a lot of restaurant employees, depending upon what you are willing to sacrifice, of course. Are you willing to serve yourself at a restaurant? When restaurants have plenty of space around the tables, it becomes practical for the restaurants to set aside one or more areas with utensils, drinking glasses, condiments, and other items that people are likely to want during their meal. Instead of requiring everybody remain at their table and wait for a restaurant employee to provide them with service, people could be told to pick up whatever items they please. Since all of the food is free, the restaurant employees would not care if somebody takes extra orange juice, bread, butter, or salsa. Another advantage with spacious restaurants is that they make it practical for people to push carts around. This in turn makes it very easy for people to provide themselves with place settings, utensils, condiments, and drinks. Instead of each person picking up their own plate, napkin, etc., one person could get one of the carts that are full of such items, and then everybody can take what they need. 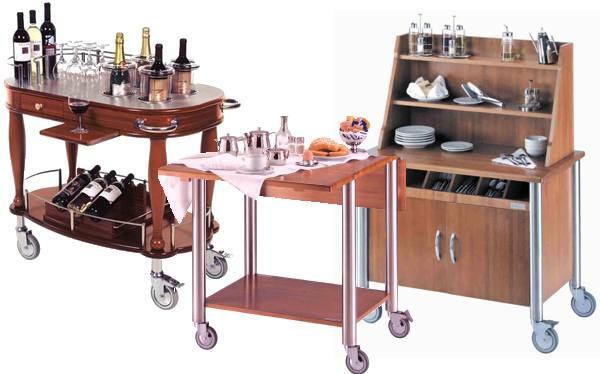 This also allows a person to get to a restaurant before his friends, push the cart over to a table, and then set the entire table for everybody before the other people have arrived. There could also be carts for cleaning the table. At the end of the meal, somebody could get one of the cleaning carts, and then everybody can put their plates and utensils onto the cart, clean the table, and then push the cart over to the kitchen. As you can imagine, providing food for free and allowing people to push carts around a restaurant would be impractical and wasteful with the type of people who dominate the world today. In order to provide ourselves with such advanced restaurants, we would need people with the greater sense of responsibility, and who do not waste food. As I have pointed out in several different files, an organization can only be as good as its members, so if we want to live in a better society, we must raise standards for our citizens - including our own family members! - and especially our leaders. 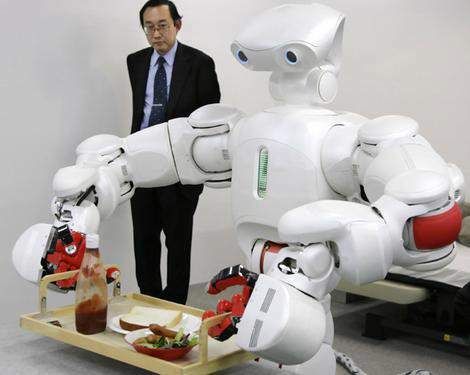 There will eventually be a point in the future at which robots are advanced enough to work in restaurants to deliver food or utensils, or to take away dirty plates. However, because they are dumb machines, robots would only be practical if the society consisted of people with the intelligence and education necessary to interact with the robots. A society of idiots would not work with robots very well. We can already see this problem in regards to computers, automobiles, and bicycles. There are a lot of people who cannot properly maintain their bicycle, or who do not realize that they have to clean the dust from the cooling fans of their computers or refrigerators. And some people know how to maintain their items, but they are too irresponsible to do so. As technology becomes even more advanced, people will need even more intelligence, more responsibility, and more of an education in order to properly use and maintain their material items. In order for robots to be used as servants, for example, we must raise the standards for our citizens. Are you willing to do that? What if your children or friends are too stupid or irresponsible to work with robots? Are you willing to treat your children and friends in the same manner that you treat strangers? How many people can use voice recognition software? How could those crude savages function in a future society in which voice recognition is common? In order for a society to put voice recognition technology in widespread use, we need to raise standards for the citizens and restrict both immigration and reproduction to the modern humans who are capable of speaking properly. I think that we should have some restaurants designed for children, and others for teenagers, and others for adults only. The restaurants that are designed for teenagers should not provide the teenagers with pampering. There should not be any waitresses or busboys. The teenagers should to be told to pick up plates and utensils as they enter the restaurant, and to put their dirty plates at a drop-off location when they're finished eating, and to clean their own table. I don't think that it is a good idea for parents or society to pamper teenagers. I think it is much better to require teenagers to do a lot of the work that they want done. I also think that it would be best if all teenagers were required to do lots of different part-time jobs at restaurants, farms, and other businesses. One reason is to let them try different jobs to help them understand their abilities and limitations, but a more important reason is that I think requiring them to try different jobs will give them a much better understanding of what is involved in maintaining a modern society. From my personal observations and experiences, the children who are pampered don't seem to have a very good understanding of what is involved in producing food, clothing, homes, or gardens. Furthermore, by requiring the teenagers to do lots of different jobs, the adults can observe them to determine if any of them are trying to avoid work or responsibility, or if some of them have problems working in a team. Also, it's important that all children be treated equally. For example, Prince Charles of England was required to learn certain skills and do certain jobs, but people like him are pampered all throughout their lives. They are never "ordinary people". The only people who truly deserve pampering at restaurants, museums, or hotels are people who are suffering from deterioration from old age, or who are recovering from surgery, or who are suffering from some physical problem due to accidents or disease. Society could provide special restaurants and recreational centers for these people, and society could offer servants for them when they visit parks, theaters, or museums. I also suggest that teenagers be required to take turns doing these type of jobs in order to help the teenagers understand the seriousness of accidents at work and the value of safety precautions, and to help them understand the aging process. I also suggest designing special neighborhoods for people with physical problems so that they have fewer stairways to deal with and more elevators and wheelchair access. As I mentioned in my City of Castles articles, if society provides free housing for everybody, then nobody has to purchase homes, and that allows people to change homes as easily as people today can switch from one hotel room to another. Therefore, when people become weak or disabled, they can easily move to a neighborhood that is more appropriate for a person of their particular physical condition. By making these special neighborhoods, the entire city doesn't have to be designed for the worst of the handicapped people. Our ancestors didn't have to worry about old people, or people with artificial legs. However, as technology improves, the percentage of people who classify as partly or severely disabled will increase, and so we should design cities to deal with this issue. The majority of people are ignoring the issue of disabilities from old-age, accidents, and wars because they don't want to deal with this issue, but those people should be regarded as crude, selfish, irresponsible savages, not modern humans. Ideally, we would raise standards for our citizens, and especially for our leaders. The people who want to play all day like stupid animals should either be exiled, or they should be classified as "savages" or as "talking monkeys", and they should be restricted from voting and getting into influential positions. We should not allow irresponsible, crude people to dominate and ruin our society. We need people who are willing to face and deal with the problems of the modern world. The products that must have quality control inspectors are the products in which a defect could result in death, environmental disaster, or wasted resources. For example, we need quality control for airplane engines, welded joints in buildings, and medications. However, there are a lot of products in which a defect is insignificant. For example, it makes no difference to anybody's life if a crayon is defective, but when parents must purchase crayons for their children, they become upset if any of the crayons have even visual blemishes. One solution to this problem is to provide the basic necessities - and especially children's products - for free. As I mentioned in other files, if a society consists of high quality people, then they will work together for the benefit of everybody, just like gears in a transmission. All of their basic necessities could be provided for free. This would allow them to eliminate a lot of the quality control jobs. For example, we don't need adults to waste their lives on the quality control of children's toys, clothing, or school items. Children can be told to do their own inspections, and deal with the imperfections by themselves. We should not design an economic system from the point of view of how to please the most people. An economy should be designed from the point of view of what is best for society. Every job should be analyzed to determine whether it has a value to society, and in addition, we have to be concerned about whether a person is going to get job satisfaction from the job. Certain jobs may please consumers, but if nobody enjoys doing them, then we should alter society to eliminate those jobs. Or, if a particular job promotes a destructive philosophy, then we should eliminate that type of job. For example, a lot of people want to be pampered like royalty at restaurants and hotels, but I don't think we should promote the idea that healthy people need or benefit from pampering. Also, there are a lot of people who treat servants in a crude manner. For example, some people make ridiculous demands on their servants, or they snap their fingers at them as if they are dogs, or them make insulting remarks to their servants. Nobody wants to be a submissive slave for selfish, arrogant people, and I don't think we should promote the philosophy that this type of pampering is beneficial to anybody. I think we should alter society so that people in the service jobs are "employees", not submissive servants. In other words, a waitress, hotel clerk, and hospital nurse should be an employee who treats you and me as if we are their friends or family members. They should not be submissive servants who must tolerate our crude or selfish behavior. Likewise, everybody in society should be told to treat their waitresses, hotel clerks, nurses, and other people as friends and family, not as submissive slaves. Waitresses, nurses, and other servants should not have to tolerate abusive behavior from anybody, not even children. They should be able to tell children to sit down and shut up. Animals do only the bare minimum necessary for survival, so when they have enough food, they have a tendency to lay down and do virtually nothing. Animals are also extremely arrogant, so they regard everybody else as a potential enemy, or as an inferior creature. The people who want a society in which there are lots of servants to pamper them, and especially the people who want to be able to treat their servants as slaves, are behaving like an arrogant animal, not a modern human. And the people who want to get rich, quit their jobs, and spend their lives entertaining themselves are also behaving like animals. Our technically advanced era needs a more advanced human. We must evolve into a creature that truly wants to do something useful for society, and who will be honest and responsible without threats, rewards, or punishments. We must evolve into a creature that will clean up after himself, and who enjoys learning, thinking, and socializing. We should not design society to fit the behavior of crude people. We should switch to a philosophy in which people are gears in a transmission. We should treat one another with respect. Nobody should be a submissive slave. None of us should have to tolerate abuse. As of today, businesses are in competition to please the consumers, but the majority of consumers are not much better behaved than the stupid, selfish, arrogant animals. The end result is that businesses tell their employees to treat customers as kings and queens. This is encouraging arrogance, not reducing it. As of today, if a nurse, teacher, waitress, stewardess, or retail store clerk were to tell an abusive customer to shut up, or if they were to reprimand a child who was badly behaved, they would get in a lot of trouble, and possibly lose their job. I think a better society is one in which everybody is required to behave in a respectable manner, even towards people in the service jobs. Employees should be able to stand up to abusive customers, including abusive children. Most people do not want to clean up their messes, or recycle their garbage, but how many people want to be a janitor or a maid? If a society were to raise standards for their citizens and exile those who did not clean up after themselves, then they would be able to reduce a lot of the jobs involved with cleaning and garbage. In my neighborhood, we put our trash bins along the street, and a truck drives by to empty the containers with a mechanical arm. This has eliminated some unpleasant jobs. As of today, we separate our garbage into three different trashbins, 1) ordinary trash, 2) recyclable trash, and 3) trimmings from grass and bushes. If people were even more responsible, then we could separate trash to an even greater extent. For example, we could have a small trashbin for light bulbs, and another trashbin for batteries. 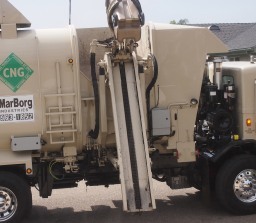 Unfortunately, a lot of people are too stupid or irresponsible to place the trash bins in the proper location for the trucks, so the driver frequently has to get out of his truck and adjust the positions of the trash bins so that the mechanical arm can grab them. Even if the sidewalks were clearly marked as to where each trash bin should be placed, some people would not be able to follow the rules. If a society had higher standards for citizens, then we could design our cities for totally automatic trash removal. 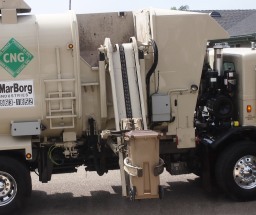 We would separate our trash into bins, and each trashbin would be placed in a certain, designated location, and during the night, when most of us are sleeping, a computer-controlled truck or train would travel around the city to empty the trash bins. If people were living in the type of castles that I have described in some of my articles, then every floor of the castle could have a set of "trash tubes". Each of the tubes would be for a different type of trash. One tube might be for batteries, another tube might be for clothing, for example. People would separate their trash into the appropriate tubes, and the trash would fall down the tubes into trash bins in the basement of the castle. An underground, computer-controlled train would drive around at night to pick up the trash from each castle. Some types of food are best made in large containers and then dispensed into small bowls, such as soups. However, as I show in my articles about cooking fish, beef, and chicken, when the meat is cooked in the same bowl that it is going to be eaten from, none of the juice is lost. Also, there are no cooking utensils to clean. Furthermore, if we design special bowls with thick bottoms that retain heat for a long period of time, then the food will remain warmer as we eat it. This can reduce the amount of labor needed at restaurants, and it provides better and warmer meals. 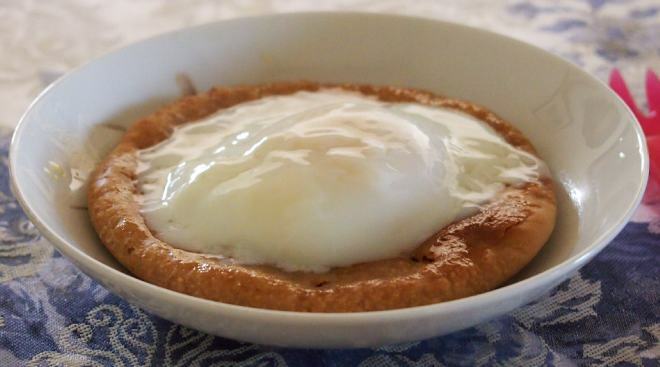 Now that I can eat breakfast, the photos below show one of the simple breakfast meals that I have been making recently. To reduce the time I spend making this meal and cleaning up afterwards, I bake the bread in the same bowl that I eat it from. I start by grinding whole grains. (In this particular example, it was mostly oats, with some wheat and buckwheat, which are soft enough to be pulverized by a coffee grinder.) Then I mixed in some water, ascorbic acid, and yeast, and let it rise a bit. 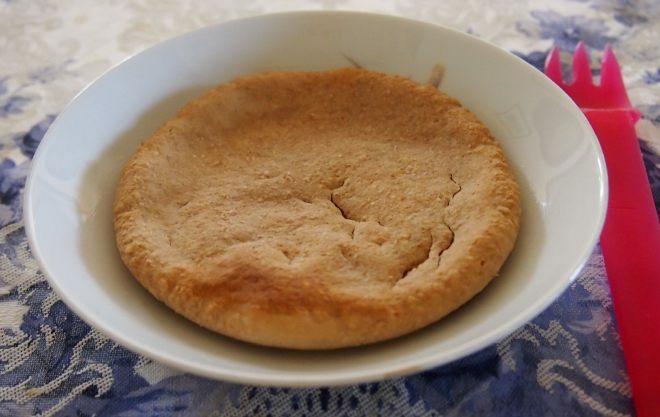 Then I spread it into the bowl that I plan to eat it from (photo below, on the left), and put it in a warm toaster oven to rise once more, which could be 30 minutes or longer, depending on how much yeast I put into it. Incidentally, in case you did not know, you can buy yeast in bulk at a much lower price than those tiny packages that the supermarket sell. For example, Smart & Final sells it in one and two pound packages, and so does Amazon. 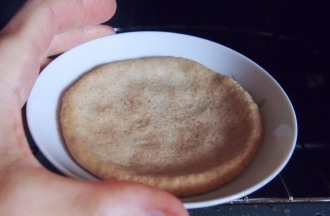 The dough being placed in a warm oven. The dough has risen and is ready for baking. This small, thin piece of dough takes only about 10 minutes to bake, which is the same amount of time that it takes to make a gelled egg, as I described in the video at this page. So, while the bread is baking, I am also making the gelled egg. They both finish at the same time. 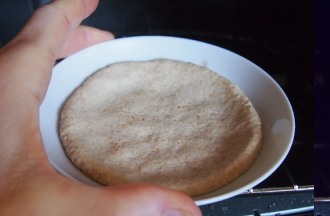 The photo below shows the bread after it has been baked. I cover the bowl for most of the baking cycle, and then remove the cover for the final minute or two. This prevents the thin piece of bread from drying out. I could now put something on top of this bread, such as pizza sauce, or pieces of beef, bacon, or fish, and then put it back in the toaster oven for a bit, and then eat it. 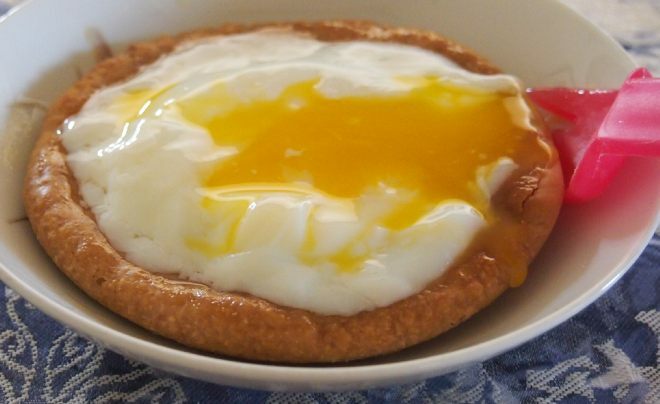 However, on this particular morning, I put a gelled egg on the bread. Because the top crust of the bread is not very absorbent, I first poked the bread with a plastic fork to fill it full of holes, and for these particular photos I put mild olive oil on the left half of the bread, and some butter on the right half. Incidentally, if you wonder what type of olive oil I prefer with eggs, I have only tried a few different brands, but so far I prefer this mild oil from Napa Valley Naturals. You might also enjoy the cultured butter once in a while. Then I put the gelled egg on the bread. Next I break open the egg yoke, sprinkle some salt on the egg, and eat it! Plastic forks are ideal for this type of meal because they don't make noise, and they don't scratch the bowl, either. 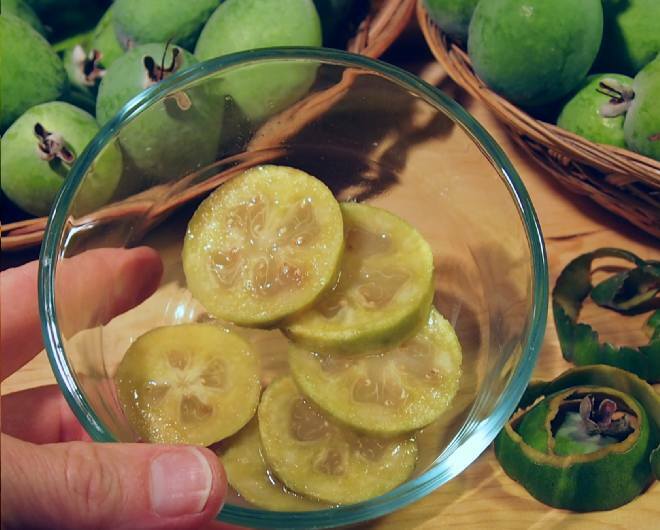 In September and October my guavas and figs become available, but before I was taking the thyroid hormone, I couldn't eat many of them without feeling unpleasant afterwards. As I mentioned earlier, I assumed I had a problem with blood sugar and insulin, but perhaps my problem was primarily due to low thyroid hormone levels. Whatever my problem is, I can now have guavas and figs for both breakfast and dinner! As I pointed out in this article about desserts, rather than fear or condemn desserts, we should make healthy desserts so that desserts can be a primary part of our meal. 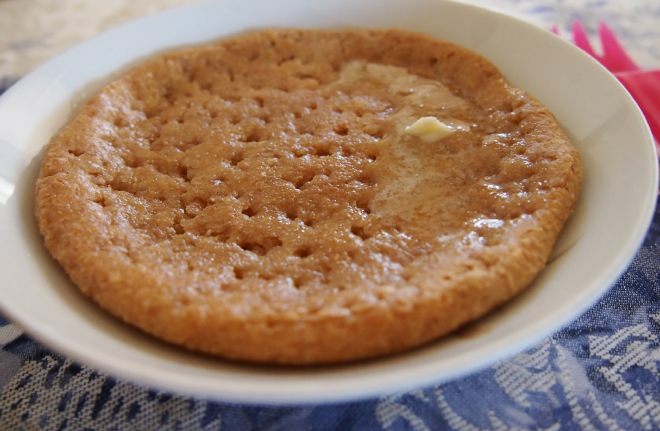 Stevia can transform a lot of foods into desserts. 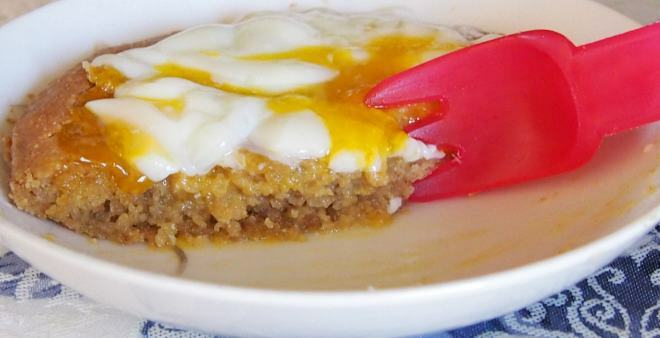 So, here is how I have been transforming guavas and figs into desserts. It is not easy to see in the photo below, but I put some water into the bowl, added some stevia and vitamin C, and sliced some guavas into it. The vitamin C stops fruit from turning brown, and the stevia counteracts the tartness and turns it into a dessert. I eat this with a plastic spoon rather than a metal spoon because plastic spoons are quieter and don't scratch the glass. 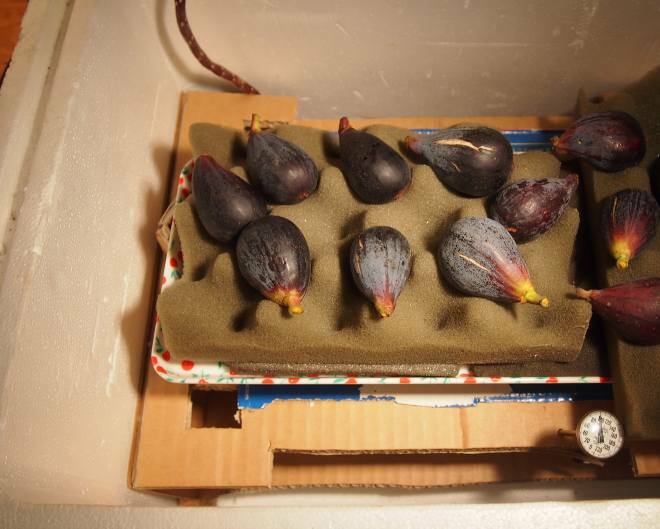 After I pick figs from my tree, I put them in a sunny window for one day to finish ripening, as I described in my file about desserts, but during the past few weeks, it has been cool and cloudy in Santa Barbara, so I put the figs into a Styrofoam box with a heater that keeps them at 40°C to 50°C (110°F to 120°F). After one day of sitting in this warm container they are a bit more ripe, and then I cut off the stems and put them into a bowl with some water and stevia. 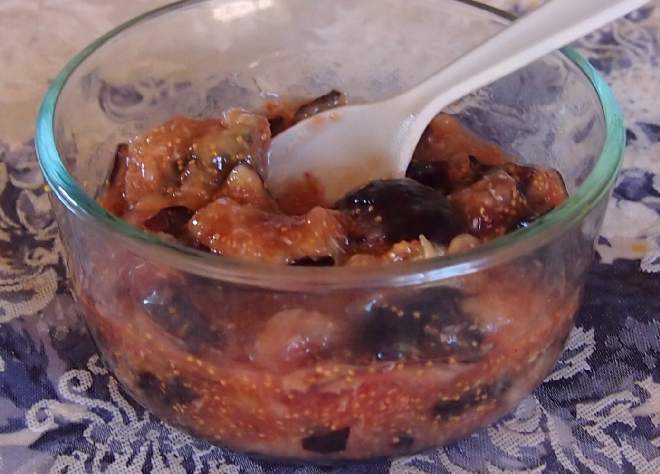 If I am very careful, I can keep the figs in the form of slices, but if they are very ripe and soft, it is easier to stir them up, which creates a very thick, fig jam that I eat directly from the bowl. I prefer the fig jam to have big chunks of fruit and skin so that I have something to chew on.